Before the 2008 election made the people and politics of Alaska headline news, those of us in the “Lower 48” were cozy in our stereotypes of everyone there living in igloos and freezing their buns off sliding down immense glaciers. Quickly melting that chilly imagery is rhythmic power alt-rock trio Static Cycle who has been burning up the indie music scene in Anchorage, Alaska since 2007, rocking everything from local clubs to the Egan Convention Center. Over the past two years, the band has not only become the biggest band in Alaska, but also a nationally recognized act, touring 14 states in the U.S. (including dates in New York, Boston, Denver and L.A.) and sharing stages with major artists like Seether, Puddle of Mudd, Eve6, Emery and 36 Crazyfists. 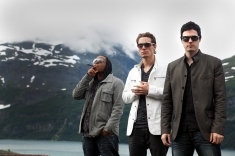 In late August, the band brought its explosive mix of rock, hip-hop, R&B, pop and world music to the Alaska State Fair, a 12 day event whose lineup included Collective Soul, Shinedown, Kenny Rogers, Lonestar and BoyzIIMen. The sonically innovative sounds of Jared Navarre (vocals, guitar), Josh Witham (lead guitar) and Dennis Smith (drums) have been bringing the heat—and breaking the “static cycle” of mundane, cookie cutter indie rock. Yet the three, who are totally “in” on the goofy way people think about their home state, riff brilliantly off the cold imagery as they get set to release “Inside This World Of Mine,” the compelling, symphonic-rock driven debut single from their upcoming EP, Part 1: Hydrate. In mid-September, the rockers will be shooting the video for the track in two very wintry locations, starting with the world renowned Ice Museum/Hotel in Fairbanks. It is a structure that is built completely out of ice, including the building’s walls, floors, ceilings and bar area. The second locale is literally on an ice glacier. Word has it the Alaska locals are nervous because if they start jamming, Static Cycle may just cause an avalanche! The band breaks the mold not only with its eclectic music, but also with a unique marketing approach where their debut will be released in two EP installments, digitally and in CD format, rather than as a single full length project. Part 1: Hydrate and Part 2: Rehydrate will include five tracks, plus bonus instrumental and a capella mixes to give fans a taste of their vibe in different forms. The single is primed to break on alternative radio specialty shows and college stations across the country. Their notoriety helped them snag superstar producers for both the new collections and their 2008 debut project When We Meet Again. The first was helmed by producer/engineer Mike Brown (Papa Roach, Breaking Benjamin, Garbage) and they worked on Part 1: Hydrate and Part 2: Rehydrate with Josh Weaver, aka “Tone,” whose superstar credits include Green Day and Santana. The chemistry and stylistic diversity of Static Cycle comes from the unique set of musical influences each member brings to the mix. Navarre complements his harder rock tendencies with a soft rock and R&B touch. The band’s principle lyricist and melodic writer, he’s been singing and playing guitar professionally since he was 10. With his previous band Crail, Navarre won the Rock Category at the 2004 annual Alaska Song of the Year competition. Witham is a rhythmic, highly structured guitar player that fuses dynamic percussive rhythms with gripping rock licks. Originally from Kansas, he previously brought his dashing blend of simplicity and complexity to the cult phenomenon Grain. While pursuing music in his early 20s, Jared—who hails from the now famous little town of Wasilla—entered the corporate world and used some of the money he made working for an IT company to launch an independent label. Smith and Witham had started writing for Static Cycle’s first album when they met Smith, whose hip-hop and gospel infused rock backbeats helped complete their sound. Smith has also played everything from heavy metal to blues behind many of Alaska’s most successful bands. Unlike most indie bands that play tons of live gigs and build a fan base before getting into the studio, Static Cycle had everything in place—including a finished album and line of merchandise to sell—before they ever stepped onstage. This inspiring DIY spirit has been part of their “Lower 48” tours as well; they spent hours before gigs “street teaming,” passing out flyers to let people know they were playing. Once people see Static Cycle live, they’re never quite the same. The trio is in motion the entire show, and Navarre proudly recalls a recent performance where he jumped so high he split his head open on a beam that ran across the ceiling! That kind of energy has driven Static Cycle to their current status as the best rock band in Alaska. The release of the new recordings will bring renewed musical notoriety to the state best known for the metal band 36 Crazyfists and being a storied part of Jewel’s childhood.